Movie: Tokumei Sentai Go-Busters the Movie: Protect the Tokyo Enetower! Romaji: Tokumei Sentai Go-Busters the Movie: Protect the Tokyo Enetower! Tokumei Sentai Go-Busters fights to protect the giant energy Tokyo Enetower from the evil Vaglass organization. If they can not stop the mass transmission, which is planned by Vaglass's Enter, the mass transmission will take place in multiple cities. Due to a meta virus (Sabiru), which was developed by Enter, Buddy Lloyd is rusted and the Buster Machines can not be used. 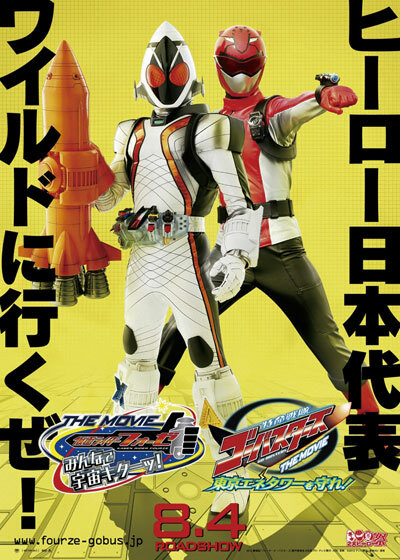 Movie was released as a double bill with "Kamen Rider Fourze the Movie: Everyone, Space Is Here!" on August 4, 2012 in Japan.